As first-responders made their way into some of the hardest-hit areas by superstorm Sandy, the death toll rose to 110. Scott Pelley also reports the insurance industry estimates economic losses at $50 billion, second only to Hurricane Katrina. Nine weeks after superstorm Sandy slammed New York City, the need for help continues. Tony Guida (CBS News) speaks with a Sandy refugee who shares his struggle to get back to normal after losing everything. CBS News:New Orleans' new $14 billion levee system kept the city dry but at least 12 surrounding parishes experienced flooding. 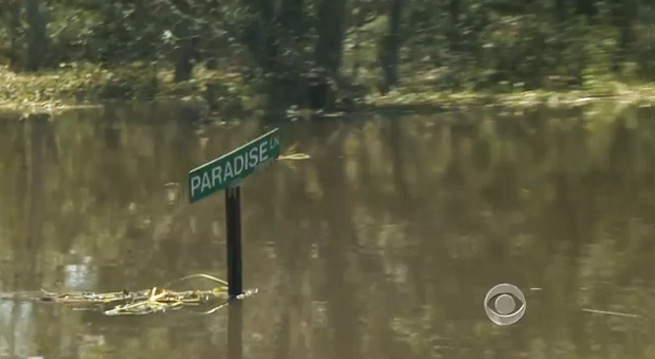 Manuel Bojorquez reports on the painfully slow recovery from Hurricane Isaac. Nothing is more important than providing food when people find themselves suddenly, and often critically, in need following a storm, earthquake, flood or other disaster emergency. USDA makes sure that people have enough to eat. Hurricane Irene approaching the coastal area of North Carolina. Do not fear that which harms the body. God, our Eternal Father, knows of your pain and despair. And He will lift you up from your earthly trials and fears and with his Spirit bring joy into your heart and life. Never forsake Him, He will never forsake you even in the tornado and wrath of the seas. He loves you for all eternity. Jesus said, "But, Nathaniel, there is much in the Scriptures which would have instructed you if you had only read with discernment. Do you not remember that it is written: `My son, despise not the chastening of the Lord; neither be weary of his correction, for whom the Lord loves he corrects, even as the father corrects the son in whom he takes delight.' `The Lord does not afflict willingly.' `Before I was afflicted, I went astray, but now do I keep the law. Affliction was good for me that I might thereby learn the divine statutes.' `I know your sorrows. The eternal God is your refuge, while underneath are the everlasting arms.' `The Lord also is a refuge for the oppressed, a haven of rest in times of trouble.' `The Lord will strengthen him upon the bed of affliction; the Lord will not forget the sick.' `As a father shows compassion for his children, so is the Lord compassionate to those who fear him. He knows your body; he remembers that you are dust.' `He heals the brokenhearted and binds up their wounds.' `He is the hope of the poor, the strength of the needy in his distress, a refuge from the storm, and a shadow from the devastating heat.' `He gives power to the faint, and to them who have no might he increases strength.' `A bruised reed shall he not break, and the smoking flax he will not quench.' `When you pass through the waters of affliction, I will be with you, and when the rivers of adversity overflow you, I will not forsake you.' `He has sent me to bind up the brokenhearted, to proclaim liberty to the captives, and to comfort all who mourn.' `There is correction in suffering; affliction does not spring forth from the dust.'" "For in it the righteousness of God is revealed from faith to faith; as it is written, but the righteous man shall live by faith"